With the winter officially behind us, it's time to refresh your makeup routine with some new and exclusive products from Sephora inside JCPenney. Spring time is all about florals and sunshine and I love my makeup to reflect that. I headed to my local Sephora inside JCPenney looking for rosy pink tones with hints of gold and sparkle. And of course, the staff there was so nice and helpful. And right in the middle of the store they had all their new and exclusive items easily accessible. I found so many great new products that I had to have. Over the past couple weeks, I've been incorporating them into my daily makeup routine and couldn't be happier. 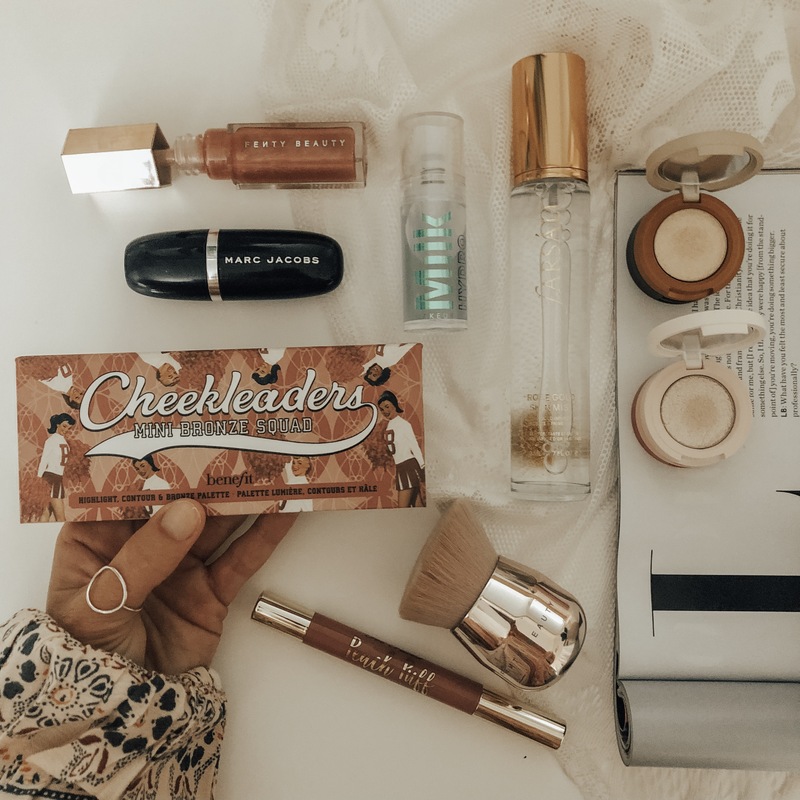 I thought I'd give you a quick rundown of my new favorites and how I use them. Hydro Grip Primer by MILK Makeup: In order to get your makeup to last all day, you need to start with a solid base primer and this one is perfection. It has a refreshing aloe scent and is a slight sticky gel texture which is different than most creamy primers. It gives you all day hydration and hold without any greasiness. To apply, pump 1-2 shot(s) of primer on the back of your hand and then blend a thin layer onto your clean skin. Make sure to wait at least 1 minute for it to fully absorb and activate the "grip" before applying the rest of your makeup. Accomplish Concealer & Touch-Up Stick by Marc Jacobs Beauty: I'm a busy mama who gets little sleep and definitely needs a great concealer to use under my eyes. I love how it comes in an easy-to-apply stick and it's convenient enough to throw in my purse for touch ups if needed throughout the day. You can apply it using your finger, a beauty sponge, a concealer brush, or swipe the stick directly onto your skin. After foundation, I apply it under and around my eyes and on any blemishes. It's full coverage and crease resistant! My favorite part is the little dip which makes it really easy to apply with your finger tips for touch ups when you're on the go. Cheekleaders Mini Cheek Palette by Benefit Cosmetics (color Bronze Squad): This might be the most coveted new product of all. This mini palette is a bronzer, highlighter and blush all in one. 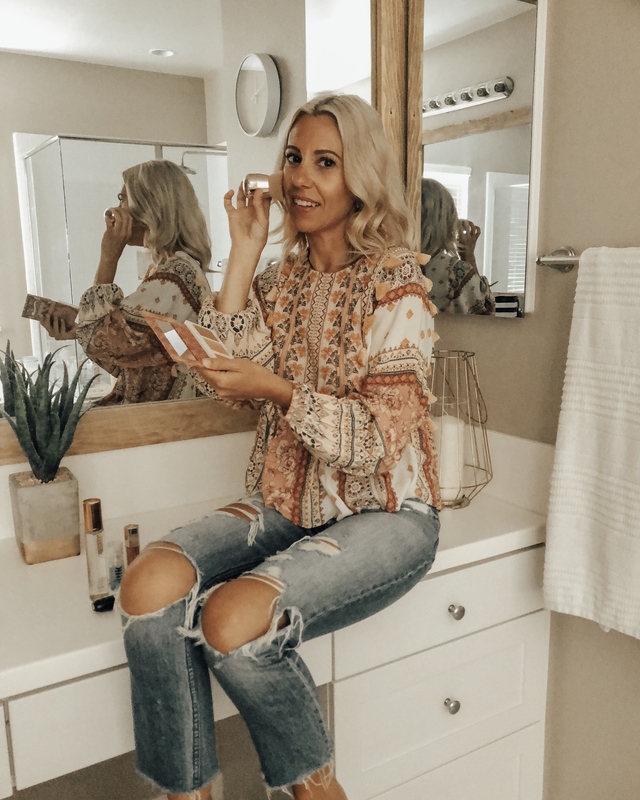 It features the iconic Hoola Matte Bronzer, the ever popular Gold Rush Golden-Nectar Blush and the new Cookie Golden Pearl Powder Highlighter. To apply, start with the bronzer down the hallow of your cheeks and make a big C for subtle contour. Add the blush to the apples of your cheeks and then finish with the highlighter on your high cheek bones. I love that it gives me the perfect bronzed glow! Kabuki Brush 160 by Fenty Beauty by Rihanna: This multi-purpose brush is perfect for applying anything from foundation or bronzer to all over body shimmer. I love using a makeup sponge for my foundation but love using this to apply my bronzer. The angled brush is perfect for getting just the right amount of blending and the brush color is just so cute. Beauty Bento Bouncy Shimmer Eyeshadow Trio by Kaja Beauty: This new Sephora exclusive brand is like the bento box of beauty. Everything comes in small compact sizes like this eyeshadow trio. And it's all about the shimmer! I love the toasted caramel (bronze tones) and the rosewater (rose tones) and I find it's best to apply the shadows with your fingertips rather than a brush. That helps it stay on your lids rather than fall everywhere from the brush. Peach Puff Long-Wearing Diffused Matte Lip Color by Too Faced: When I first saw this product, I was intrigued with the applicator process and so I asked one of the makeup specialists at the store and she raved about it. So glad I took her advice because it really is so good. It is not a regular lipstick but a lip stain so the color lasts for hours and it didn't dry out my lips. I went with the rosey pink shade "Day Drinking" and can't wait to pick up a few more colors. Gloss Bomb by Fenty Beauty by Rihanna: I'm a true lip gloss girl and so of course I had to try the new Gloss Bomb. Let me tell you it did not disappoint! I went with the "Fu$$y" shade which is a shimmering pink and it has the perfect amount of shine. I love pairing it over my lip stain for longer lasting color or just wearing it alone. It's the perfect new Spring lip gloss. Rose Gold 24K Skin Mist by Farsali: First off, this smells absolutely AMAZING! And who doesn't want to add a little gold shimmer to complete their look?! 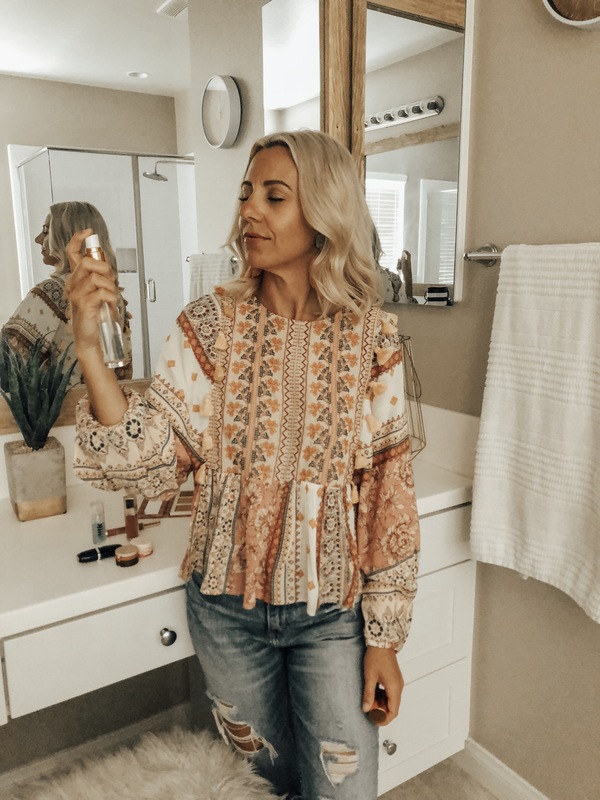 This mist is a hydrating, priming and setting spray all in one. It leaves your skin feeling refreshed and helps keep your makeup intact. It's the perfect way to finish your look! 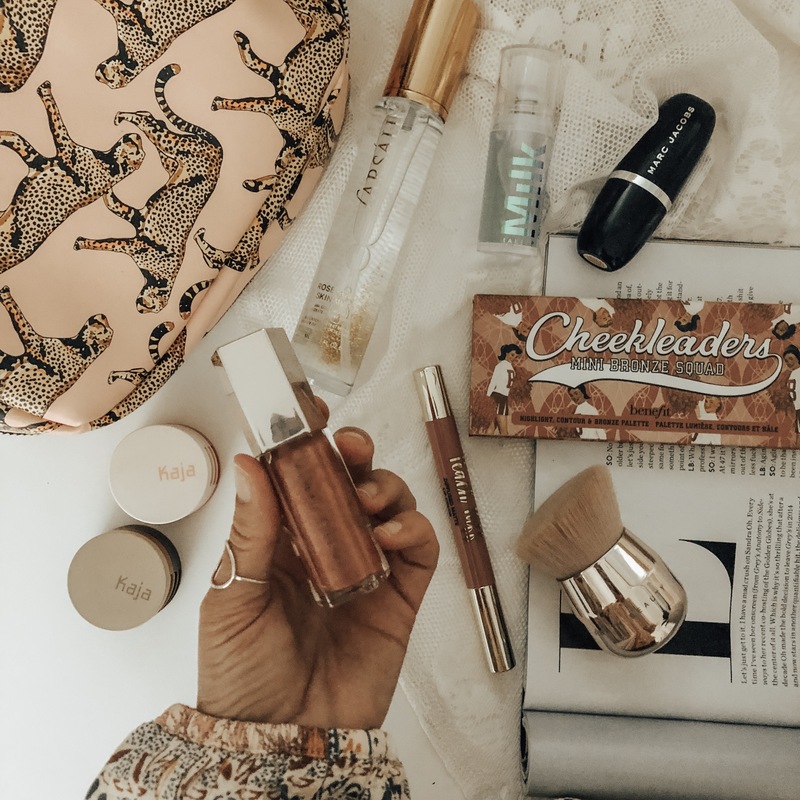 There you have it- my 8 favorite new makeup products for Spring. Check out my IGTV for a quick little makeup tutorial. Which one are you most excited to try? Comment below and let me know! Thanks so much for stopping by! Happy Spring! !